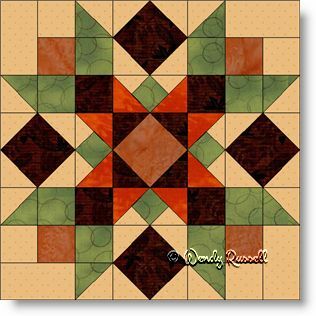 Choose the Blue Ridge Mountain Star quilt block if you would like to make a larger block and therefore you require fewer blocks to make a quilt. A win-win situation! This is an eight patch block that is actually sewn in "chunks" (as I like to call them) and assembled as an uneven nine patch, just to make the whole sewing process easier. The block features half square triangles, some square in a square patches and a few quarter square triangles thrown in for good measure. The two sample quilts illustrated are wonderful examples of how the same quilt block can look so very different, just by altering how you set the blocks into a quilt.